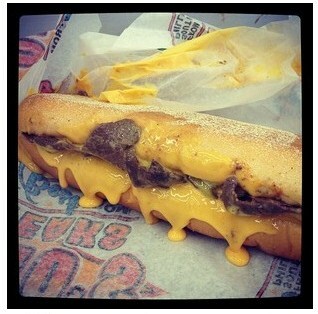 *Pat’s recommends Cheez Wiz- A classic Philly Cheesesteak. I asked the workers at Pat’s what the best cheesesteak combination was, and they said Cheez Wiz, grilled onions and American cheese. Done. That’s exactly what I did, and it’s definitely the way to go. Cheez Wiz might be my favorite thing in life lol. Can’t imagine it any other way. It’s a must! And of course some hot sauce lol…. Started in 1966. Geno’s actually recommends Provolone cheese over Cheez Wiz. Also, the steak is not “frizzled” and shredded, it’s more in long, thin strips. It also comes wrapped neatly in paper, while Pat’s is served open and unwrapped. Added some ketchup and peppers at the condiment bar. Geno’s was also good, but not as good as Pat’s. The steak was a little cold, and didn’t have as much flavor. Geno’s had more cheese than Pat’s, which the cheesier the better for me, but it wasn’t mixed in with the meat like at Pat’s. This tasted more like a grilled cheese sandwich, rather than a cheeseteak…the steak got lost with the cheese and bread. Pat’s won because I simply liked the meat better.